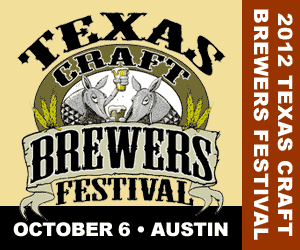 The 2012 Texas Craft Brewers Festival is taking place on Saturday, October 6th at Fiesta Gardens in Austin and tickets are now on sale. A General Admission ticket is $20 which includes a wristband, six 4-oz sampling tokens and a Commemorative TCBF tasting cup. A VIP ticket package is also available which includes a 2-hour meet & greet session with brewers before the festival begins, first access to special limited beers, a festival t-shirt, festival pint glass (upon exiting festival), wristband with six 4-oz sampling tokens and commemorative tasting cup. A list of participating breweries and available beers will be released closer to the day of the event.